How do you choose a trustee? What qualities should a trustee have? Alisa Shin and Sarah Price of Vanguard Advice Services discuss the requirements for a trustee and how to go about choosing one. Liz Tammaro: And, Alisa, what are the pros and cons of creating a trust? Alisa Shin: That’s a great question. People hear the word “trust,” and they automatically think of controlling people, and that’s not necessarily true. There are a lot of different types of trusts. I think most trusts that people are familiar with are trusts that are irrevocable, trusts that can’t be changed. And for a lot of people, that’s scary because they end up—They think they’re going to create this document that will date back to the dinosaur age, and, you know, they can’t ever change it again, and so they have to live with it. And that’s not necessarily true. Trusts, irrevocable trusts, are really used for many reasons. One, obviously, if you have children or beneficiaries who are young and who can’t manage the money, a trust is a way to protect that money, to put a structure in place for the investment management and the management of how the assets are distributed to the beneficiary. And you can time it out so that a 15-year-old isn’t getting a large sum of money, and they can get it at a more appropriate time. The more common reasons why people also use trusts is, one, to provide asset protection. A properly drawn irrevocable trust can protect those assets from future creditors in case the beneficiary gets sued, and a future creditor can also mean a divorcing spouse. So even if a beneficiary doesn’t have a prenuptial agreement, an irrevocable trust, if it’s drawn up correctly, could protect those assets so the divorcing spouse could not get those assets. Liz Tammaro: And I’m hearing you say irrevocable doesn’t necessarily mean not changeable, right? Alisa Shin: Correct. So there’ll be restrictions as to who could make the change, but a lot of times, when we talk with clients here at Vanguard, we really encourage clients because we just don’t know what the future is going to entail, to empower a beneficiary to have the ability to change the terms of the trust and determine who should get it at the beneficiary’s later passing, at their death. And that’s typically called a testamentary limited power of appointment. It’s limited because you can decide who could receive the money. You could say that your child could give it to anybody they would like, or you could say that they can only give it to their descendants or charitable organizations. You can make it as broad or as restrictive as you would like. Liz Tammaro: Okay, so you talked about some of the benefits of a trust. How about, are there any drawbacks to creating trusts? Alisa Shin: You know, the drawbacks of creating a trust, it creates a little bit of a complexity in your life. When someone has a trust, that trust is a separate taxpayer, technically. It will have a second taxpayer identification number. So that means that that trust will have to file its own income tax returns, meaning the trustee will do that for them. It will have a separate account that won’t be combined into your own personal account because you want that to make sure that it stays protected from future creditors and so forth for the reasons we discussed. Sometimes, depending on who your trustees are, there are additional costs associated with the trust. You need to, if you have a professional trustee serving, they might charge a commission. Clearly, if you have an accountant who’s preparing the tax return, there’s going to be one additional tax return that needs to be prepared for that trust. Liz Tammaro: And one other thing, I’ll just open this up to both of you. I heard you say that it’s really important that it’s drawn up properly. Talk to me a little bit more about what you mean there? Alisa Shin: In terms of, I assume, asset protection and so forth? Liz Tammaro: Yes, the trust. You said it’s really important that it must be drawn up properly; the document must be— What do you mean by that? Alisa Shin: There are certain provisions, something called a spendthrift provision that would need to be included in the document. I would say, in today’s day and age, a spendthrift provision is almost always in every trust document. But the other part of drawing it up properly is understanding what impact guaranteeing money from the trust would have for your beneficiary. So if you create a trust that says, “Pay the income to my beneficiary every month,” because that’s a guaranteed income stream, that income stream loses its protection from a future creditor. Whereas, if the trust said, “The trustee has the discretion to use the income for my beneficiaries’ benefit,” that gives it a more solid layer of protection from a future creditor or a divorcing spouse. So when you think about asset protection, divorce protection, it’s really a balancing game between giving your beneficiary access to the money and some comfort knowing that he or she might be able to get the money that they needed versus leaving it to a trusted advisor, a trusted family friend to make sure those assets are protected. All investing is subject to risk, including the possible loss of money you invest. Diversification does not ensure a profit or protect against a loss. 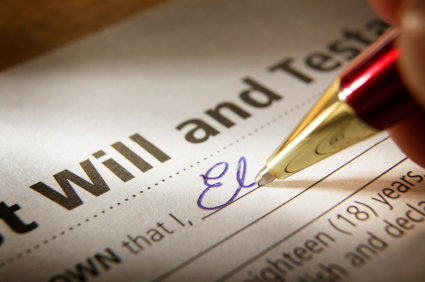 Read more on the subject: Download Free Probate Guide.